In a previous post I discussed the Devonshire Hunting Tapestry “Bear and Boar hunt” in the context of the VM crossbowman’s dress. Artists and portable works, such as illuminated manuscripts, travelled widely around the continent, leading to a common aesthetic among the royalty and higher nobility and considerably reducing the variation in national styles among works produced for the courtly elites. The main influences were northern France, the Netherlands, the Duchy of Burgundy, the Imperial court in Prague, and Italy. Royal marriages such as that between Richard II of England and Anne of Bohemia helped to spread the style. Part of the reason of the style’s international success and homogeneity was the fact that it was popular in art forms which could be moved around, like manuscripts and tapestries, as opposed to for example carvings on churches. Although of course there are famous examples in architectural decoration as well, like various series of North Italian frescos. Bagpipe sleeves seen in the tapestry went out of fashion around 1430. The sleeves meant are ones with baggy “pipes” but close-fitting cuffs (at the wrists) of which a number are depicted on the tapestry. This appeared to me as an exceptional opportunity. Dress and fashion are usually decent indicators of period, and we have an example here of clothing which can – if it can be confirmed – be dated to specific decades. When and where was it fashionable for men in similar tunics to wear baggy-elbowed sleeves? The final point, about shoulder padding, is necessary to distinguish our style from later trends which puff up the sleeve entirely, giving the men a “hulkish” appearance. This is not what we see in the VM archer. Above an example of a fresco (1405-1410) in the International Gothic style, no puffy shoulders. Under that a figure from a manuscript dated to the second half of the 15th century. The horizontal line and top-heavy block created by the widened shoulders would have been atrocious to Gothic eyes. The hulk-look became the norm after bag-pipes went out of style. It’s easy to recognize and was avoided for this study. Next, I created a thread at the Voynich Ninja forum inviting members to share examples of such particular sleeves. A sizable basis was offered by JKP, who has previously written about this topic, and then expanded upon. The garment was certainly international European. Most examples were found in the regions of France, Southern Germany, Northern Italy, England and the Netherlands, a spread which overlaps that of the courtly gothic style. In other words, the archer’s dress won’t help us narrow down a region; but we’re after a date range, so how about that? Since we are interested in a specific date range, it was essential to find accurate datings of as many manuscripts as possible. This was not always easy, since holding libraries don’t always provide this information, and we found a few cases where an obsolete dating was used. I only included those cases where a relatively reliable date could be found. Starting date: when did bag pipe / bat wing sleeves become fashionable? With the Victoria and Albert Museum’s description we have a tentative end date of 1430 (which we can test later) but no starting date was mentioned. As it turned out, it was hard to find any examples before 1400. Only one workshop provided exceptions: that of Giovannino de’ Grassi, who produced a number of relevant manuscripts at the end of the 14th century. His Tacuinum Sanitatis manuscripts contain the only examples of our sleeve type which can be confidently dated to slightly before 1400. JKP has also noticed that the style is especially popular by people using a tool or weapon. I would speculate that in these early examples, they were wide, open sleeves which were somehow tied around the wrist when engaging in manual labor (shaking a tree in this case). The look then became a thing of its own. End date: when did bag pipe / bat wing sleeves fall out of fashion? Our findings largely confirm the V&A museum’s end date of 1430. Almost all post-1430 examples we found were outside of manuscript art: a handful of frescos and paintings. There are without a doubt a few later examples in manuscripts as well, but those are hard to find. The prime examples is – it needn’t cause surprise – Diebold Lauber, who made a living recycling a stock of old imagery for his mass production of paper manuscripts. Before 1400: a few highly original, avant garde, high quality manuscripts by de’ Grassi. Within the 1400-1430 period and focusing on manuscript art, the division looks as follows (only manuscripts which could be dated to a specific decade were included). There’s a strong onset in the first decade, after de’ Grassi’s pioneering work. By 1421-1430, bag sleeves are already less popular in manuscript art. The Livre de Chasse was a hunting manual written by master huntsman count Gaston Phébus in 1387-1389. The work was hugely influential and survives in dozens of manuscripts. Two of the earliest manuscripts deserve our attention in the context of men’s sleeves. Have a good look at the two images below. They illustrate the same passage: three hunters, a dog, a boar. The top image is from BNF MS fr. 619, illustrated by Jean de Toulouse in Avignon under supervision of Fébus himself, 1390 ca. There is no trace yet of baggy sleeves: the men either have tight sleeves or roll up the sleeves of their overgarment. The colour image is from BNF MS fr. 616. It was modeled in Paris after an older manuscript like MS fr. 619. around 1407. In 1390 the Gothic style we’re after was budding in Italy, only making an appearance in the most innovative illustrative projects (de’ Grassi). Seventeen years later it has exploded over Europe, and Parisian illustrators feel compelled to dress Phebus’ huntsmen after this fashion. That is how we move from the hunter on the left (1390) to the one on the right (1407). The VM archer’s dress belongs to the latter type (right). The Voynich manuscript’s vellum has been carbon dated to 1404–1438. The study of one of its most standout fashion aspects has confirmed this date range, with a slight preference for the earlier part. This has strong implications for researchers who wish to argue that the manuscript was written at a certain time. If you want the manuscript to have been produced somewhat before 1400, then you must argue that it was as groundbreaking as de’ Grassi’s highly original illustrative programme. Any dating of its production before 1380 would be at odds not only with the carbon dating, but also with the figures’ dress. If you want it to have been made after 1430, then this also implies that the Archer figure was copied without much thought, in an extremely specific dress type which would have been obsolete and old fashioned by then. Anything after 1438 would ignore the results of the carbon dating and the fact that the baggy-elbow fad had been forgotten for a decade by then. In short, the archer’s dress appears to confirm the estimation of the vellum to 1404-1438 and, if taken strictly, would refine this range to 1404-1430. According to our extensive search for the relatively rare phenomenon of bat-wing sleeves, it was especially popular during the first decade of the 15th century, and gradually declined during the 1420’s. And the ladies? Let’s cross-check. The crossbowman isn’t the only one in this section with characteristic sleeves. Both women (Virgo and the female of Gemini) wear a similar dress with dagged sleeves. I created a similar thread on the Voynich ninja forum, asking members whether they knew any parallels, but good examples proved difficult to find. Still, both JKP and VViews managed to find a few candidates. One justified remark that was made about some of my proposals was: is this really a sleeve or more like a cape or the edge of the dress? The Voynich women wear sleeves that are clearly separated from the dress; they don’t touch the ground and aren’t folded back. This eliminates a large amount of my initial contributions, but we are left with the most certain parallels. Even though this sample is more limited, it still presents a strikingly similar image to that of the men’s sleeves: early attestation in de’ Grassi’s work, then a surge in popularity from ca. 1400-1420. The examples we found were mostly North Italian and French. The clothing worn by the crossbowman, Virgo and female Gemini belong to the style of (courtly) International Gothic. Focusing on the sleeves allowed us to determine that this style was most popular in the first two decades of the 15th century, with a decline in use during the 1420’s. Later examples are relatively rare and mostly found outside of manuscript art. The most notable exception might be Diebold Lauber, who was known for mass-copying old stock images. These results can be seen as a confirmation of the carbon dating of the manuscript’s parchment to 1404–1438, with a preference for the earlier half of this range. As always, exceptions are possible, but venturing outside of the 1400-1430 range has consequences for one’s claims. I’m happy to see you considering the men’s and women’s fashions together. I wanted to look into women’s sleeves but wasn’t able to carve out enough time to do it, so it was especially interesting to read that they are temporally consistent with men’s fashions (and also with the radio-carbon dating). A very nicely argued paper. Sorry I missed your ninja appeal for comparative examples. Do you mean ‘the manuscript was manufactured’ or ‘ the text now in the manuscript was first composed’. Are you proposing a sort of ‘authorial’ idea, without any author in mind? If the latter, it would be an extraordinarily difficult argument to maintain across all the content in this manuscript, because one of the reasons for the extraordinary disproportion of time and discussion given the centres of the calendar is that so very little else offers support for hypotheses about a late, and a Latin origin. I should like to lend you my own support, but I’m sure you’ll understand: we have to draw the conclusions indicated by our own investigations. Diane: I mean written in the most literal sense, as in “put to paper”. I have no idea what the text says, and the images are a mixed bag. But you are right to point out the ambiguity, usually I try to use terminology like “manufactured”. But well, you know what I mean. The crossbowman etc have all appearances that they are contemporary with the manuscript’s creation. At least – as you well know – in any other artefact their fashion would be used to determine the date of manufacture. By focusing on two separate aspects and cross-referencing their dates of appearance, it turned out they belong to the 1400-1430 period. Oh I see, – you mean that they appear to confirm the date-range offered by the the vellum’s radiocarbon range. Reasonable point. 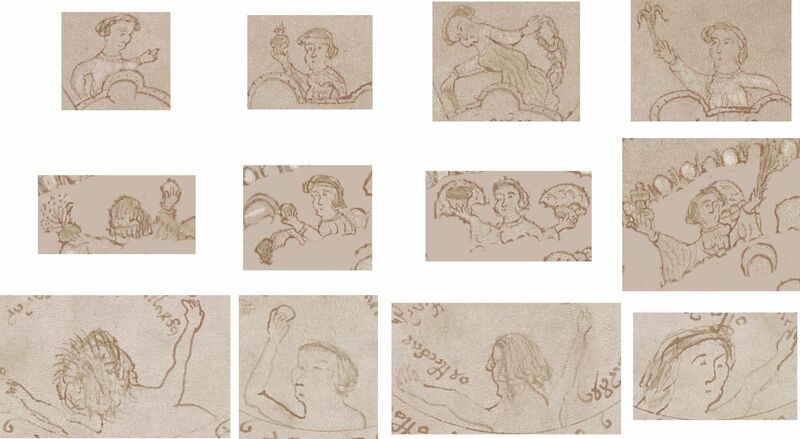 From my own perspective, the drawings we see in the Voynich zodiac roundels still looks like a *copy* of an earlier (probably German) zodiac series, something almost indistinguishable from the output of the Lauber workshop. So the fact that the original crossbowman drawing is without much doubt from 1400-1430 (as you correctly argue) gives us only an earliest date, not a latest date. 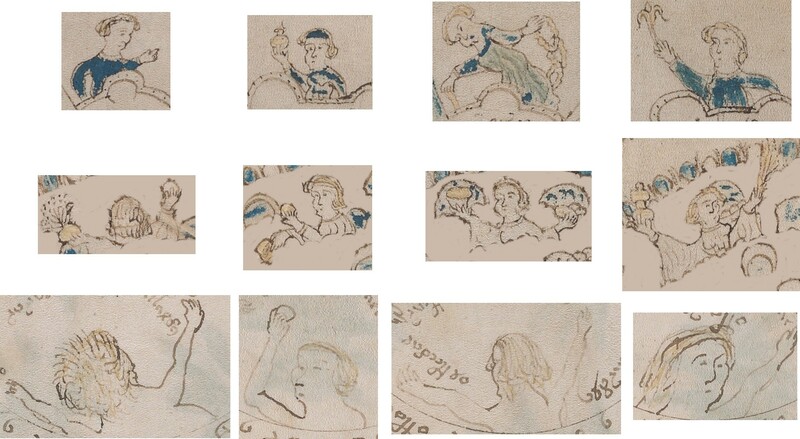 If you want something interesting to work with, look at the sleeves in the drawings in the Voynich itself, not just in the (probably copied) zodiac roundels (there are more than a few non-naked people there). Nick: we can’t discount the possibility that what we are seeing was copied from a 1400-1430 source at a later date. After all, Lauber did it too. BUT as far as I know this was exceptional, clothes were generally adapted to contemporary taste. If you assume a date of creation after 1430, then this also means that the copying (of these specific images) was done in an exceptionally non-invasive manner. As for clothing in the rest of the MS, well, my focus has been to get as much as possible out of the Zodiac figures, I also consider them a somewhat separate group. Nick: separate sources, yes, I can see numerous reasons. But why older? Koen: the long-held view has been that the zodiac roundels drawings are late medieval, while the Voynich balneo drawings (for example) are Early Modern / Renaissance. This was from the differences in things like the hairstyles, and even the drawing styles. What your bagpipe sleeves research reveals, however, is that despite their more fourteenth century appearance, the zodiac roundels are almost certainly from the early part of the fifteenth century, which I think is a new result. Nick: ah, I understand. I would say the other images are from an older source, with surviving traces of classical imagery. But I guess there is only a fine line between this and Renaissance, which was precisely the rediscovery of ancient models. But that aside, I’m glad there appears to be some common ground: that the Zodiac figures were copied (i.e. not invented on the spot) and from a 1400-1430 source. If one were to look for this source, this information should be of use. Koen: I’d also add that I think it fairly unlikely that anything else in the Voynich Manuscript came from that same German Lauber-esque source. Another interesting exercise you might consider is the 2 x 4 = 8 figures on the pair of magic circles (one plain, the other obscured) on the reverse side of the nine rosette foldout. It seems quite clear to me that these were probably copied as a pair of magic circles from a pre-existing source, though my research into magic circles hasn’t yet uncovered any explicit source. As with the bagpipe sleeves, these eight clothed figures may possibly have enough secondary fashion detail between them (e.g. sleeves etc) to date their manuscript source. For example, plain round necklines, plain round cuffs, lots of vertical pleats, some bagpipe sleeves in the second (hidden) set of four but not in the first, etc. I’d be very glad indeed to have a source to cite for that earlier observation. Do you recall if it was made at the first mailing list? Diane: I’d have to check later, but it was certainly long in the tooth by the time I wrote Curse. I believe it was from the old mailing list era, circa 2000, in a thread with Rene Zandbergen. Nick, right now I can’t specifically remember this point. I’m also (temporarily, hopefully) quite limited in searching for it. Of course, we need to keep in mind that, at the time, the best guess for the date of the MS tended to be 1460-1470, based on Panofsky’s second opinion, and Toresella’s opinion. I later argued in a poll (as recently dug up by Koen), that the date could be earlier, but this was based on my own, and not very thorough, interpretation of the hand of f116v. Koen, I’ve ummed and ahhhed and doubted if I should say this, but feel I must. First – have you noticed a ‘sleeve study’ on Ellie Velinska’s blog? I assume it’s still at her blogspot. Secondly – I’ve tried since this post was published to read the Voynich archer’s sleeve as you’ve done – that is, as a bag-sleeve, but I really can’t. To me it is much closer to the ‘batwing’ /dolman sleeve, but even so I do know ms where you’ll find both forms in a single image ; such as the lady of the castle in bag sleeves and her factor (or some similar class of person.) in the other sort. As an item of dress, the dolman/batwing sort of sleeve formed part of traditional costume, and lasted much longer than the extravagant fashion for bag-sleeves. In the study on the forum we included both baggy sleeves and batwing sleeves, as long as they were worn on a somewhat similar tunic. Some examples were found to postdate 1430, but mostly outside of manuscript art. Additionally, several of these later examples, like fresco series, are known to derive from the Tacuina, which were a driving force behind the spread of the international gothic style. Do you know of any concrete examples? I’d like to see what you mean. Also, keep in mind that I cross-checked this with the women’s dresses, where I was able to adhere to strict selection standards. The same date range of 1400-1430 was found (apart from the Tacuina, which are earlier). Koen – can you give me a non-Voynich-related source for the belief that copies of Ibn Botlan’s Tacuinum sanitatis were the “driving force behind ‘international gothic’ style”? I have two problems with it: first that copies of the Tacuinum passed through a fairly limited social network before 1440: it does not appear in Italy until about the time the papal court returned to Rome after 70 years’ residence in Avignon. Secondly – as I’m sure you know – the term “international gothic” is a modern description, first intended as synonym for ‘barbaric’. What we still call ‘gothic’ style is properly the French style: Opus francigenum. The similarly-described works of art derived (as I believed) from new artistic style accompanying that new architectural style: and similarly with the later phase which is now called (by habit) the ‘international gothic’. (Koen I’m sure you know the information given in that para. I’ve added it for passing readers). So – I’m expecting that there is, somewhere or other, a formal essay or a book of non-Voynich-related origin in which the argument is set out for the international gothic style’s being a result of access to a text written centuries earlier by a physician trained in Jundishapur or Baghdad, and who died in a Greek orthodox monastery. If the argument is that the style of clothing in some early copy of his work affected western fashions, then I suppose the point is that the style came from Antioch, or Baghdad, or somewhere. Won’t know till I read it. Did anyone on your list say how they came by the idea? Also, you misrepresent my statement, I said “a” driving force, not THE driving force. That makes all the difference. I don’t think there is one single driving force behind such an international cultural phenomenon. The “international gothic” or “courtly” style is more specific than gothic in general. It was a very specific style that existed in the decades around 1400, and was mostly expressed in all types of painted forms: paintings, frescos, manuscript art. The style knew an international success specifically because it was popular in easily transportable forms like manuscripts. Many of the Tacuina were meant as gifts. One was gifted to Viridis Visconti, who was countess of Tyrol and married to the Duke of Austria. She resided in Vienna and died in 1414. Oh, sorry – missed your asking for examples. May have to scan those from my library but will see what I can find online. In either case I’ll email before Christmas. It’s so funny to have someone else recommending the Tacuinum to me. Proof of just how far the study’s moved over the past six years. 🙂 As for the volume you’ve linked to – when those three get together the wise man just reads, learns and doesn’t forget to cite the source when repeating it.